Our flight to Rome on Ryan Air to Campino, CIA was scheduled to depart at 9:05 AM from Lisbon International Airport. It was a reasonably priced fare at $55.00 Canadian each on Ryan Air as well, a bonus when travelling Europe! As you can see you can take a plane from almost anywhere in Europe and get to another place at a reasonable price! This meant however, we had to be at the airport by 7:30 AM, so it was out of bed by 6:00 AM to get a cab downstairs by 7:00 AM. I really hate these early mornings, but it is a reality to get the cheapest fares and flights and maximize your time to get to various destinations. We were scheduled to arrive in Rome at 1:00PM, which would give us the rest of the day and evening to explore Rome! 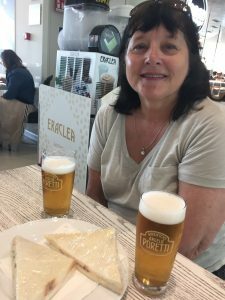 The trip on Ryan Air was uneventful, a bit of a delay leaving Lisbon with having to await the arrival of the incoming Ryan Aircraft, then the deplaning and load us us to get to Rome! Our wait was about 45 minutes and we had to wait outside on the tarmac. Before we headed out the door to the tarmac, we had enough time to grab an Egg McMuffin from McDonalds and a coffee and tea! All Good! 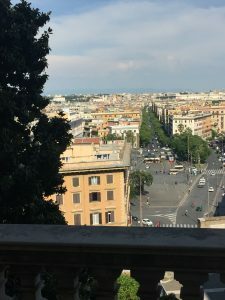 View fromThe One Vaticano Rooms, Rome! The elevator Could barely fit two People! We arrived at CIA a little late at 1:30 PM. We had arranged for a car and driver to pick us up at CIA through our hotel reservation. Good thing because our hotel, all six rooms was located in a building with no signs indicating that a hotel was located within. 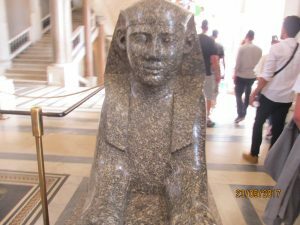 The rooms were located on the third floor of a very large building with a huge courtyard and it was certainly not easy to find. This would prove to give us all kinds of problems later! On the way to the hotel our route passed the magnificent ancient Roman Walls which still define the boundaries of the city centre. 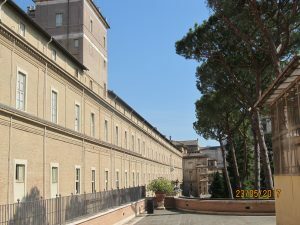 We arrived at the hotel around 2:30 PM and checked into The One Vaticano. 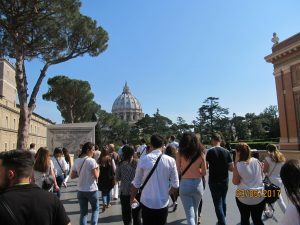 On Our Trek Up To The Vatican on the Streets of Rome! After we left the cab and the driver pointed the way inside the large courtyard, it was a chore to find the hotel. We asked someone in the courtyard but they just nodded politely! 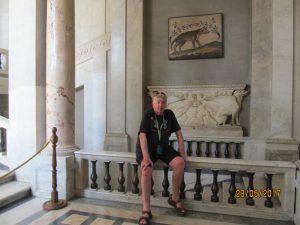 After a short while, a caretaker came round and he told us to go up three flights of stairs and we would find The One Vaticano upstairs! The guy at the front desk inside the big door was very friendly and gave us some helpful hints about where to eat. 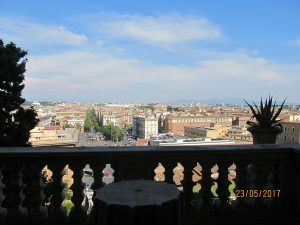 This hotel was in a great location, just a 15 minute walk to St. Peter’s Basilica and The Vatican Museums! Our room at The One Vaticano had a double bed, free WiFi, minibar, fridge, premium bedding and a coffee maker! Our window opened up onto the street front below! 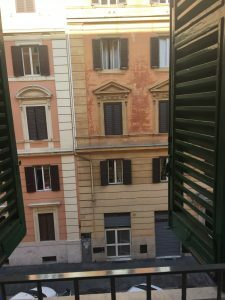 The bathroom even had a bidet and at $200.00 a night Canadian which is not bad for Rome in that location! 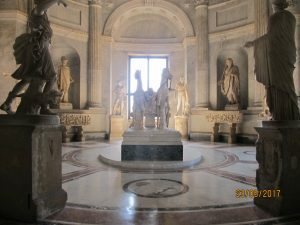 Our First Steps Into the Vatican Museums! 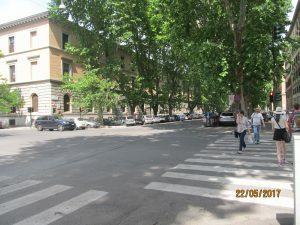 It was a hot day in Rome at 27C and very sunny. After a little break by about 3:00 PM we were on our way to find The Vatican! 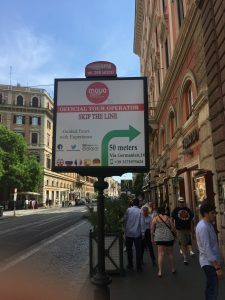 As we got closer using our I Phone to navigate, we were approached by a guy offering to give us a tour of the Vatican Museums, the Sistine Chapel and St. Peter’s Basilica. His major selling point for us was the Skip-The -Line option. 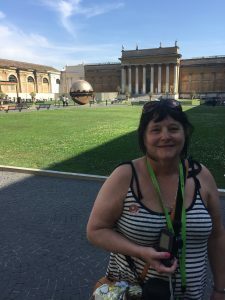 We had only the rest of the day to visit The Vatican as the next morning we were scheduled to catch a train to Naples, and from there the Amalfi Coast! Some Amazing Artifacts Here in the Vatican Museum! He looked honest enough and he led us to a storefront where we could get more information on the tour. 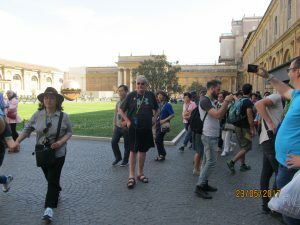 So we were sold and paid our approximately $100.00 Canadian each and after a little wait, we were part of a tour group on our way to The Vatican. It was a walking tour I should add. 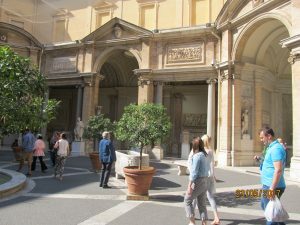 There was a bit of line-up to get into the lobby of the Vatican Museum. However, once inside we had another wait while the tour guide, a very intense Roman Woman, purchased all the entry tickets for our group to the museum. 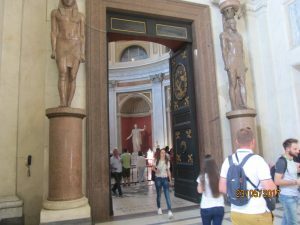 Once inside we were able to look at the immense collection of beautiful art and sculptures that had been amassed by Popes throughout the centuries! 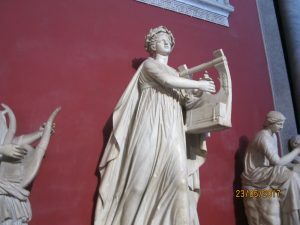 The Vatican Museum contains roughly 70,000 works of which 20,000 are on display at any one time! Pope Julius II founded the museums in the early 16th Century. We were very impressed!! 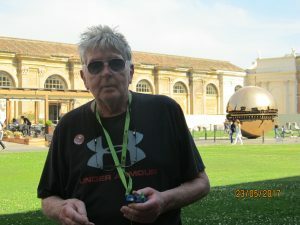 Hubby Admiring the Art Works and Taking a Much Needed Break! We passed through the famous Sistine Chapel, with its ceiling decorated by Michelangelo and the Raphaelrooms. 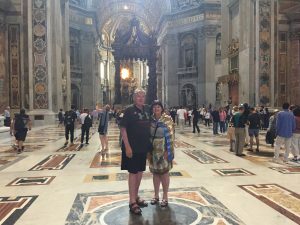 We were not allowed to take any pictures in the Sistine Chapel, but we noticed afterwards that Justin Trudeau and his wife Sophie Gregoire had their picture taken there just a day after we had been there! Rules for Prime Ministers and not for us!! 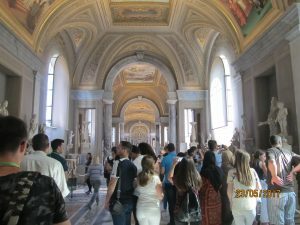 The Vatican Museums are visited by over 6 million people annually making it the 5th most visited museum in the world! 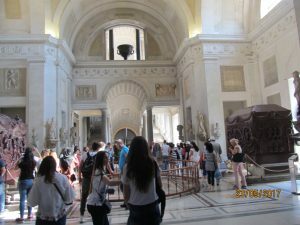 The Louvre in Paris is #1! The sheer amount of items in this museum is astounding. Worth a lot of money for sure! The Catholic Church is wealthy beyond belief! 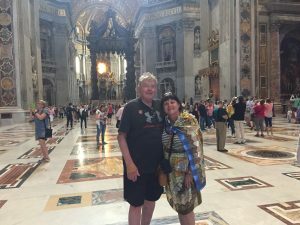 MK & Hubby Taking in the Sights of the Vatican! 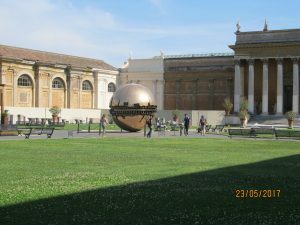 Our tour of the Vatican Museums consumed most of our afternoon. We were starting to get tired having had a full day do far which had started in Lisbon. 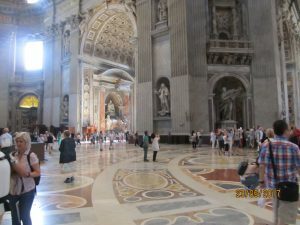 But we had to check out the Papal Basilica of St. Peter in The Vatican or simply St. Peter’s Basilica. The Papal enclave within the City of Rome, St. Peter’s Basilica was constructed in 1626. This is an expansive building, 730 feet long, 500 feet wide and 450 feet high. It is the largest church in the World and it is quite magnificent! The Vatican is a city state within the City of Rome! 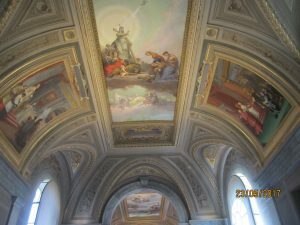 The Beautiful Ceilings of The Vatican! 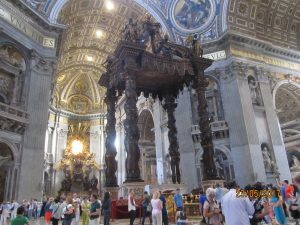 They say that Jesus’s Apostle Peter is buried here directly below the high altar of St. Peter’s. It is lavishly decorated with many sculptures and works of art right in the Basilica itself! A very impressive building for sure! Being a woman I was required to have my knees and shoulders covered. 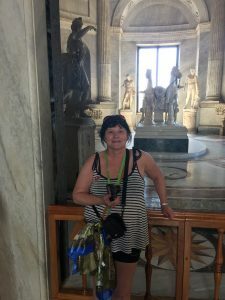 As I was wearing shorts and tank top because it was so hot in Rome this day, the guy who sold us the tickets advised that I must purchase some scarves or veils to cover myself which I did for 5 Euros at his shop. 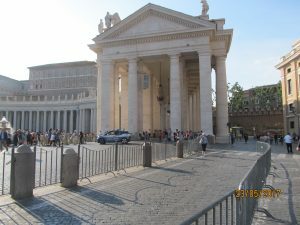 Good thing too, as the guards make sure that I was covered before I entered the Basilica! 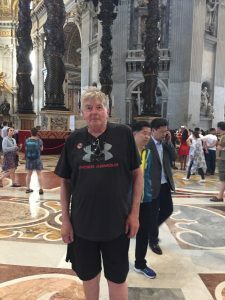 I was really impressed with St. Peter’s and being Catholic, I could at least say I had visited the centre of the Catholic Church! However, I found Monsserat in Spain a much more spiritual happening for me! 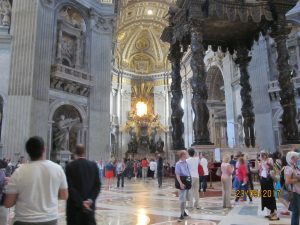 Inside St. Peter’s Basilica: Astounding Basilica! MK Wearing the Scarves to Cover My Shoulders and Knees! 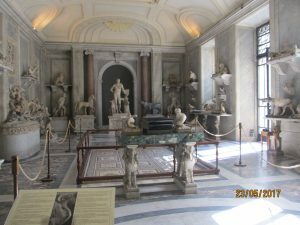 We spent a great deal of time exploring the Vatican Museums and to be quite honest, these museums hold some very expensive and rare treasures. So much so, you can see why the Catholic Church is considered the richest church in the world. The artifacts and treasures are astounding! 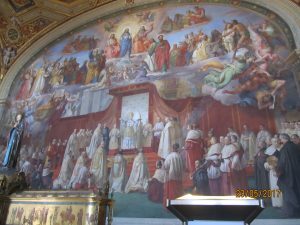 If you visit, you will see why the Catholic Church continues to be so rich. There are thousands of people entering The Vatican on a daily basis and you have to pay to get in! So the Catholic Church continues to make money on top of money! 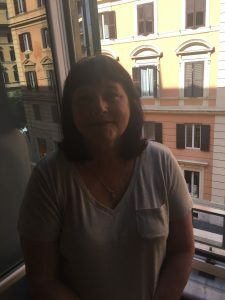 I would also have to say that I think a lot of people living in Rome make their living from The Vatican alone and I suspect that many have careers here as curators, historians, guards, working in the service industry to serve the Vatican and beyond! 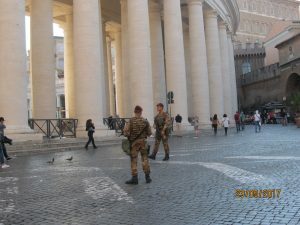 You should also be aware that The Vatican is heavily guarded with security, not only inside but outside as well, with men armed with machine guns! St. Peter’s Basilica is Truly Outstanding in Terms of Architecture! 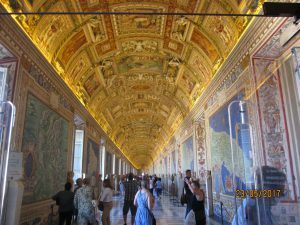 The Vatican is an amazing place and I am so glad that even with all its opulence, I got to see it in my lifetime! 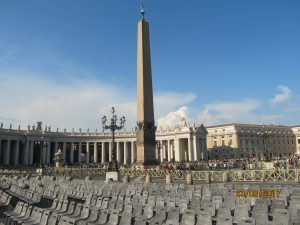 I hear people make pilgrimages here to see the Pope! He was not out and about the day we were there though! As my Doctor says you could feed the world’s starving people on the riches of The Vatican which is an empire onto itself! 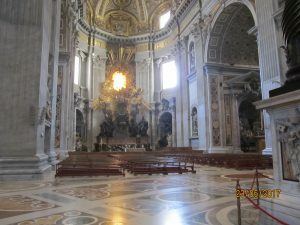 More Interior Views of St. Peter’s Basilica! 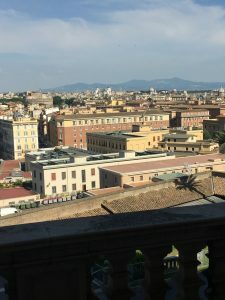 As you venture out of St. Peter’s Basilica you come out onto Piazza Di San Petro or St. Peter’s Square which unfolds like a magnificent vista before you facing East. 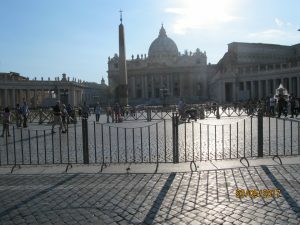 St. Peter’s Square is a massive square, the largest that we have ever seen. 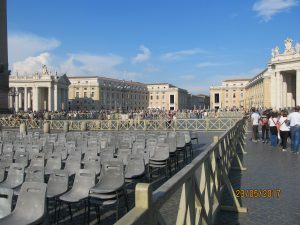 When the Pope presides over a liturgy sometimes over 80,000 people or more gather in St. Peter’s Square! 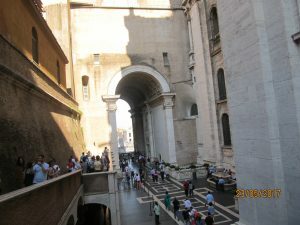 We stopped and took in the view from the steps of the Basilica and we then decided to venture out to its entrance which is quite a distance away. It was an amazing afternoon but it was now after 7:00 PM . We were counting on our I Phone to find our way back to The One Vaticano Rooms but it went dead on us halfway there. Heading Out of St. Peter’s Basilica! Now we were in a dilemma, how to find our unmarked hotel in a building like so many others in Central Rome. 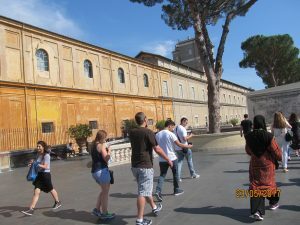 We approached a police officer, people walking their dogs, and some store owners and none of them knew where The One Vaticano Rooms was. Finally though the process of elimination and remembering a number of street corners, shops, supermarkets and restaurants, we narrowed it down. We thought for sure that we would have to get ourselves arrested if we didn’t find the place soon! Finally success, but it was now after 8:00 PM and we were dead tired after the day we had just put in! 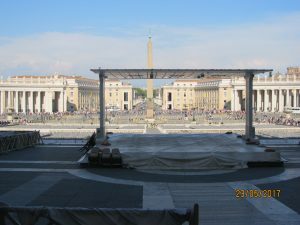 St. Peter’s Square is Massive! Getting Ready for a Big Day Tomorrow! After an hour break and a Gin with no Tonic (none to be found in Rome), we ventured out again but made sure we took a business card with the Hotel’s address on it with us. The I Phone was charged up a bit, so we decided to check out a nice restaurant recommended by our Hotel Host. The problem was that President Donald Trump was in Rome and in the neighbourhood for a G-8 Summit scheduled for Sicily later in the week. Our cell phone wouldn’t work. The authorities were jamming cell phone signals in Rome, so we couldn’t find our restaurant. 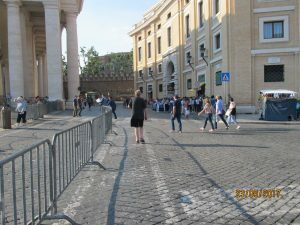 St. Peter’s Square is Well Protected but Very Open to the Public! So we settled on a sea food restaurant around the corner from our hotel. Icelandic Cod and Chips were on the menu. So we had gone to Rome for Fish and Chips! Who would have thought! Not our kind of meal for Rome for sure! We were hoping for better luck tomorrow! 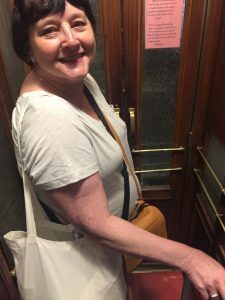 We headed back to The One Vaticano Rooms and settled in for the evening. We didn’t have to get up too early, so we made the most of our only full night in Rome! 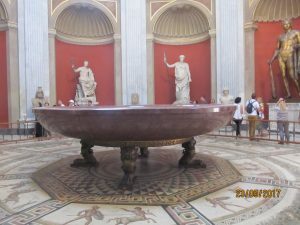 I know that many love Rome, but for some reason we were not enamoured with Rome. Don’t get me wrong! 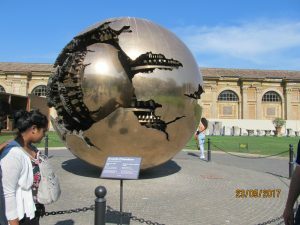 The Walled City was wonderful, The Vatican was amazing but the overall ambiance was, lets say a little lacking! The streets were cluttered with a great deal of mess and I have to say the people were not very friendly at all! Perhaps you will have a better experience than we did in Rome! MK Enjoying a Much Needed Brew After a Very Long Day in Rome! On to the Almalfi Coast tomorrow!